The 6 Best Spots for Gelato in Kentucky! Gelato is one of the best alternatives for folks craving something other than traditional ice cream. 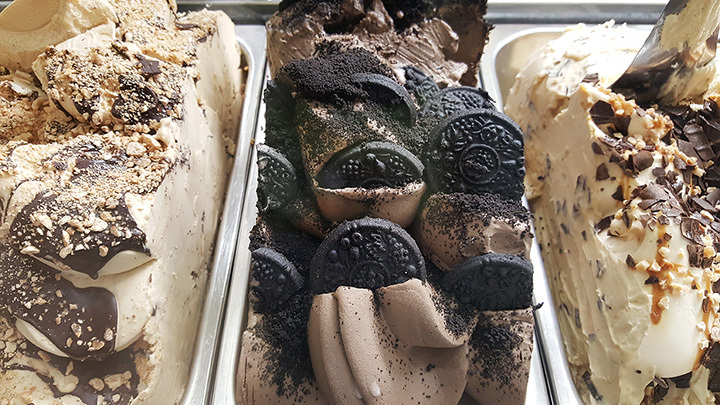 With the unique and intensive process applied to the art of making gelato, you can expect nothing less than amazing. The incredible gelato places of Kentucky do flavor right. And here are our favorites. Looking for a place to satisfy your gelato craving? Stop by Sorella Gelateria in Lexington, Kentucky, and enjoy fresh made-from-scratch gelato with Kentucky ingredients. Nutella and cookies and cream are two of the favorites, but if you’re in an adventurous mood, Concord grape with goat cheese might be in order. Opened in 2015 by two sisters who wanted to bring a high-quality ice cream alternative to the area, Sorella Gelateria has become a go-to for frozen dessert aficionados. Stop by any day of the week and get your gelato on. Sweet ‘n’ Savory isn’t your typical source for great food, specialty drinks, and desserts. As a mobile food vendor, they focus on providing alternatives for dietary-challenged folks, and they come to you at scheduled locations or by attending special events. All menu items are prepared from the freshest ingredients available, and their crepes are dairy and gluten-free and made with rice flour and free-range eggs. They have smoothies and gelato favorites, including a frozen coffee drink made with chocolate or vanilla gelato as a special treat. There are also dairy-free gelato choices that will tickle your tongue. Check their website for scheduled stops or include them in your next party or social gathering. Graeter’s Ice Cream has long been known for the best ice cream in the Bluegrass State, but they’ve expanded their offerings and locations over the last few years to include Ohio and Indiana as well. Far from a typical chain, Graeter’s has premium artisan ice cream and frozen dessert products made from the best ingredients. They introduced four new gelato flavors in 2015 that have become winning favorites, and they include black raspberry, dark chocolate mint crunch, tasted coconut, and Bananas Foster. Most locations are open every day, but check the website for specific times and locations. Considered a gastropub, Novo Dolce in Bowling Green, Kentucky, redefines great food with its unique and winning combinations of foods and flavors. With a casual and inviting atmosphere, there are menu items like lobster mac & cheese and great pub favorites like rustic potato pizza and beer braised short ribs. But you have to appreciate a place that lists desserts first, like the house made gelato. They even have a special drink called Affogato that’s espresso served over your favorite gelato. Everything is good here from the food to the service. Open every day except Sunday. If you’re looking for a great place for gelato, try Gelato Gilberto in Louisville, Kentucky. This quaint little shop uses local and internationally imported ingredients combined with fresh local milk and fruit to create over 20 different delicious flavors that you can enjoy by the cup or cone. You can even select your favorite flavor added to a graham cracker pie crust with short notice for a great ending to your next dinner party. Voted the “#1 Spot for Cool Treats” by Southern Living Magazine, this place will surely salsify! Consistently serving excellent food and offering good customer service, NiceNPan is a great choice for lunch or dinner. They have good options for vegans and vegetarians, like the vegan veggie wrap, and the coffee is always fresh and hot. One of the best things about this little eatery located in Lexington is the casual atmosphere and a very popular item is the nitrogen ice cream made on premise. You can choose your base of custard, gelato, yogurt, or sorbet and then add your favorite flavor, mix-n’s, and sauce for the top.